WineCruzer wine carrier cases protect wine bottles from being damaged during travel. Wine carriers come in various sizes including two pack, four pack, six pack, eight pack, 12 pack and 24 pack. The five, six, eight and 24 pack wine cases are available with wheels and pull handles. The 12 pack wine travel case comes with a folding pull handle and wheels. The four pack wine carriers are available either with or without wheels. WineCruzer Carry Case with wheels will hold Twelve (12) 750 ml wine bottles. Usually ships in 1 to 2 business days. Restocking fee of 25% applies to this product. Please make sure the total weight (consider bottle weight) and external dimensions of this case comply with the commercial airline restrictions before ordering. WineCruzer Wine Travel Case will hold two (2) 750 ml wine bottles. Usually ships in 2 to 3 business days. WineCruzer Carry Case with wheels will hold Twenty-Four (24) 750 ml wine bottles. Usually ships in 1 to 3 business days. Please make sure the external dimensions of this case comply with the commercial airline size restrictions before ordering. Restocking fee of 25% applies to this product. Please make sure the total weight (consider bottle weight) and external dimensions of this case comply with the commercial airline restrictions before ordering. WineCruzer Wine Travel Case will hold four (4) 750 ml wine bottles. Usually ships in 2 to 3 business days. WineCruzer Wine Carrier Case with wheels will hold four (4) 750 ml wine bottles. Usually ships in 2 to 3 business days. WineCruzer Carry Case with wheels will hold Six (6) 750 ml wine bottles. Usually ships in 1 to 2 business days. WineCruzer Wine Carrier Case with wheels will hold Eight (8) 750 ml wine bottles. Case is designed for travel. Usually ships in 1 to 2 business days. WineCruzer 8 Pack Lite Wine Carrier Case with wheels will hold Eight (8) 750 ml wine bottles. Usually ships in 1 to 2 business days. WineCruzer 8 Pack Pro Wine Carrier Case with wheels will hold Eight (8) 750 ml wine bottles. Case is designed for travel. Usually ships in 1 to 2 business days. WineCruzer Wine Carrying Case with wheels will hold a Riedel Cabernet Decanter (or a champagne bottle) plus five (5) wine bottles. Usually ships in 2 to 3 business days. 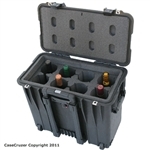 WineCruzer Carry Case with wheels will hold 5 magnum wine bottles. Usually ships in 2 to 3 business days.